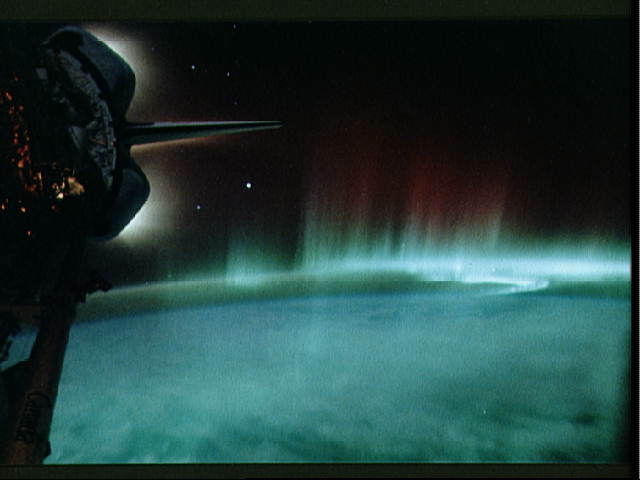 Explanation: A background of distant stars, sinuous and spiky bands of Southern Lights (Aurora Australis), and the faint glow of charged plasma (ionized atomic gas) surrounding the Space Shuttle Discovery's engines give this photo from the STS-39 mission an eerie, otherworldly look. This image reflects Discovery's April 1991 mission well - its payload bay (PLB) was filled with instruments designed to study celestial objects, aurora and atmospheric phenomena, and the low Earth orbit environment around the PLB itself. The aurora seen here are at a height of about 50-80 miles. 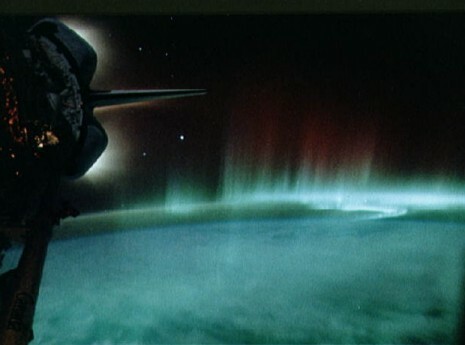 Aurora are caused by charged particles in the solar wind, channeled through the Earth's magnetic field which excite molecules in the upper atmosphere.